Remove any over wintered greens and have a hoe ready for weeding between rows of vegetables. Now is the time to make new asparagus beds and order crowns of all-male varieties for the heaviest yields. Lift mint and replant in containers sunk below ground to stop it spreading everywhere. Sow the first vegetable seeds in a warm, sheltered place. You can put potatoes in now. In well prepared ground you can use a trowel or if you need to, dig out trenches about a spade deep 60cm (2ft) apart and put manure or compost in the bottom (don’t use spent mushroom compost). 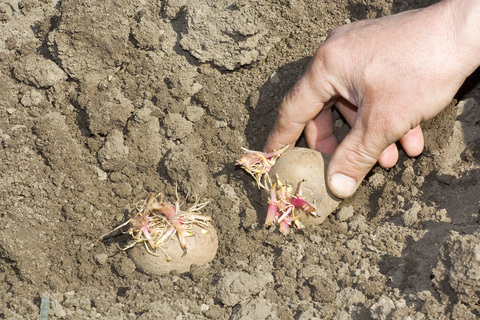 Plant the tubers on top, add fertiliser such as Growmore to the dug out soil as you mound it up over the rows.